We're coming up on the end of April and I know many of you have finished your little nine-patch quilts for our Small Quilt of the Month Challenge. I even made this one. It went very fast. I was able to finish putting the binding on it yesterday. Just a reminder - there are still a few days left before April is over and we start in on another one. For this free pattern, see here. I went to Indiana earlier this week to give a presentation and teach a workshop. While I was showing some of my quilts I mentioned that I was challenging quilters (you!) to make one small quilt a month from some of the patterns in my books. They looked at me like I was . . . absolutely NUTS. Every guild has its own personality and from the quizzical looks on their faces I figured out that this was a group that mostly made large bed-sized quilts and did not like to "play" with the small ones. Quilters who don't make small quilts don't get the "obsessive" part of it--it really is addicting. I think it's because with little quilts you have the freedom to make all of the designs you love and dream about in such a small time frame. Once you begin you know you can finish pretty quickly and then go on to the next, and the next and the next . . . . I was able to make an Amish quilt and a Crazy quilt, quilts I knew I would probably never make in full size, even though I admired and loved looking at them. It's a lot of fun to experiment like that with different blocks, styles and fabrics. There are even times when I'm drawn to more modern fabrics (oh no!) and have toyed with making a very bright-colored quilt. Just for fun. I don't think I will ever give up making reproduction quilts from the 19th century though. I often have a hard time coming up with a quilting design for my small quilts and sometimes just do what's easy because I'm in a rush to finish (and move on to the next one!). I've used some of my favorite stencils over and over. Last weekend I thumbed through this book of small quilting designs by Shirley Thompson (now out of print, unfortunately ) that I've had for awhile to see if I could use one of the designs for the plain blocks. The quilt I made is so simple I thought it needed something to "spiffy" up those plain blocks. I didn't have a good light source to trace the designs and did not want to open up my dining room table, take out the leaf, stick a lamp underneath and then run to Home Depot to buy a piece of glass to fit the leaf. Way too much trouble. I seemed to remember that my daughter had a light-up desk when she was a child and wondered if it would work for this. OR if I even saved it. So I scrounged around in the basement for 15 minutes until I found this Crayola light tracing box from her Barbie Fashion Designing days when she was eight. (Lord only knows why I was saving it, maybe just for this?) I copied the design onto tracing paper with a black marking pen and then put my quilt top on top of the box with the design underneath and traced it onto the fabric with a washable fabric marker. Then I layered the quilt and quilted it. My first try - and I have to say I think it turned out okay. I need to tweak my method a little for next time - the quilt shifted slightly on the box while I was tracing - but all in all not bad. Yes, I know, it is very sparsely quilted. I usually do more but this time I was anxious to get it done so I could show you before the month was up. Depending upon how much more time I want to spend on it, I think I will just quilt around the blocks a bit more and then call it finished. Still cute. 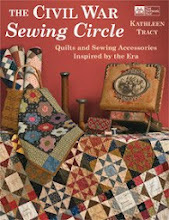 The next quilt (for May) will be taken from my book, The Civil War Sewing Circle. If you are keeping up, we're a third of the way toward making 12 quilts this year. Yippee! I'm having fun, how about you? Hi Kathleen, I just finished my nine-patch mini quilt, thanks for sharing the pattern! I also just posted about it, I linked to you. I finished mine this week...just need to take a picture and get it posted! Thanks for the pattern. 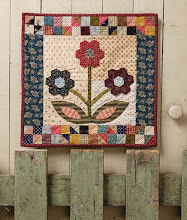 I am excited about doing a quilt from the Civil War Sewing Circle! Small quilts are the most fun to make which is why I have so many. I like to put one together within a few days and it's done! Love your quilts and looking forward to your next challenge. I haven't participated in the last two and I wish I did! Just didn't have time then. Keep up the good work. I too love small quilts, and have made dozens of them. It is fun to play with colors and patterns you wouldn't make in a full size quilt. Great job on your finish! I am looking forward to seeing the next pick! I am following along, just waiting to get quilting done before I post them on the Yahoo group! Looking forward to the next Small Quilt then! 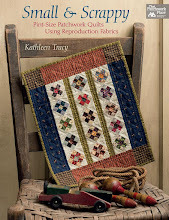 It's a beautiful little quilt and I also have that great book of quilt designs! I'm still trying to get caught up on my little quilts! If only there were more hours in the day! I love the freedom of trying different design ideas with little quilts. I am so glad that I joined in your small quilt group. I am catching up, but I don't want to do that too fast. I just bought The Civil War Sewing Circle so I am ready for the next one! I mark quilting designs by "stitching" the paper tracing on the sewing machine, with a large needle and no thread and then using quilters pounce over the paper - very easy and no need for a light table. I will have to try the Pounce method next! I love that book, Think small. I guess their loss is our gain, little quilts are cool too, and so much more easily to display. I think that it's funny that you found and used your daughter's light-up Barbie table, because I used to use my kids' Mickey Mouse light-up table for just the same thing! I haven't seen it since I moved...must look for it! 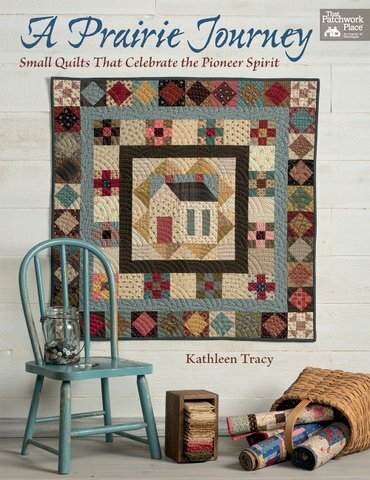 I love the small quilts for all the same reasons already cited. And they are just FUN! I have a couple of spots in my house that I have small quilts that I change out often. I feel like I have accomplished something finishing a new quilt for those spots. Another quick solution when you need a light box is to use your computer's screen as long as it is on a fairly light page. Hi Kathy, I think the reason we all like (Small) quilts so much is the same reason we all think all baby's are so cute, even animal baby's (Like a snake,skunk )I could just go on and on with the list of cute baby animals, right? I have that book also and love it, and your quilt is very cute!! Karen/IL. I think your quilt is lovely, as is the quilting. Personally, I don't like too much quilting on small quilts, and it's not because I'm lazy and don't want to do the quilting. I think the quilters at your workshop are missing out on not making some small quilts because they are so much fun, and a fast finish. Sometimes, people who only do large quilts don't know how to display small quilts. Of course, they are only limited by their imagination, but people do ask me what do I do with them. What do you do with yours? Thank you. I don't really like a lot of quilting on my small quilts either but always feel I should do more. I display some of them on tables and a few on the walls but do not have a lot of wall space and so just switch them off every now and then. Most of them "rest" in a cupboard, unseen, until I take them out when I travel and show them off to guilds. Hi Kathy! I've been a lurker of your blog and yahoo group for quite a while - have all of your books, and enjoy making little quilts. I'm also doing the little quilt a month, and hope to establish an album in the group very soon to put my photos in. I can't wait to see what you've picked for us next. Keep up your great work! It looks so much different then my quilt. You used some beautiful fabrics in your Doll quilt! I look forward to see what you have in store for us very soon !!! What a wonderful source that book is. I will have to look for it. My nine patch quilt is done, the top anyway. I need to start quilting it. I love the blue with green one ...nine-patch in the middle ... it springs out sooo nice :o)!!! I too love making small quilts. I think you can be a little more adventures and try new ideas. If you want to make a hot pink and orange quilt you can without wasting a lot of time and money. Then if it turns out fabulous you can then make it big if you still have the desire! Liz - that's so true! How can you not love little quilts? I usually donate mine to guild for the silent auction, but I get the fun of making them. I'm working on mine. I just need to quilt the plain blocks and bind it. I have the March basket quilt cut out but had to finish a big project before going any farther. Now I can work on my little quilts this month! Thanks for getting us going with the little quilt a month challenge!